If you have recyclable materials in your garden, such as these old concrete slabs (which looked awful laid as a patio), we can help you re-use them in a creative way. 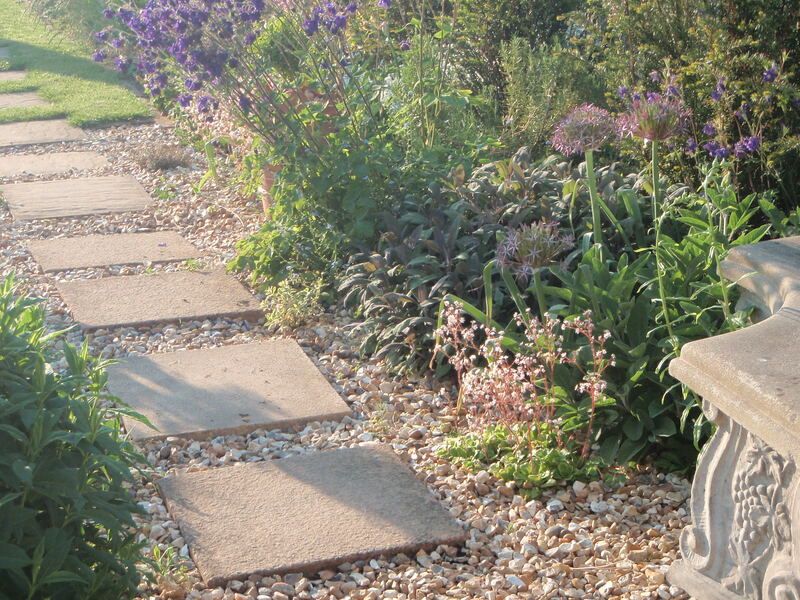 Here we used the slabs as stepping-stones through gravel with lots of frothy plants to soften the edges… ECO-FRIENDLY and FREE!!!!! u&i garden price per hour, plus expenses. For GARDEN COACHING, we charge by the hour. 10am to 3pm weekdays concessionary rate for over 65’s, £25 per hour. We do not charge travel expenses within a 10-mile radius, but we do charge travel expenses outside this radius. We can also support garden projects for children and social groups – please contact us for more information. If you have ideas for other special garden projects you would like us to get involved with, please do get in touch! For this price, you will receive one-to-one guidance in your own garden on what you need to do to achieve your plot’s full potential, plus the physical help to achieve it… from a fully qualified horticultural professional. Call now on 01980 842709 or send us an email!